Simple to make, these creamy garlic prawns are best served with rice and ideally suited for a weekend lunch or weeknight dinner. 2. Add the garlic paste and stir well. 3. Add the flour and stir again. 4. Remove the pan from flame after 20 seconds. 5. Pour the stock and cream to the pan. 6. Stir until well combined. 7. Place the pan over medium flame, stirring until the sauce thickens. 8. Add the mustard, salt and pepper powder. 9. Now add the prawns to the pan and stir well. 10. Simmer until it starts to boil and reduce flame. 11. Cook for 5 minutes or until the prawns are done. 13. Serve with cooked rice. 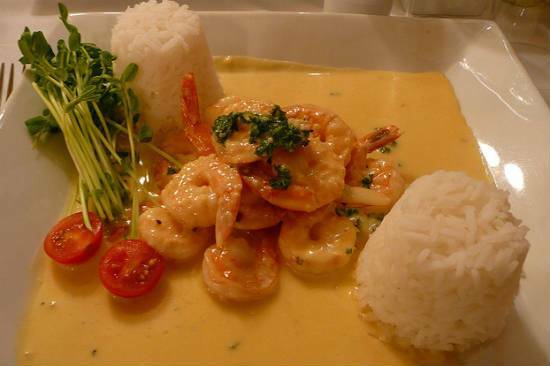 Feel free to comment or share your thoughts on this Creamy Garlic Prawns Recipe from Awesome Cuisine.